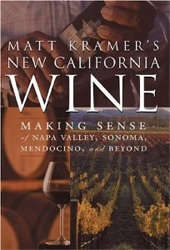 Matt Kramer is one of the most dedicated and opinionated American wine writers and he gives us all his knowledge and opinions in his revised edition of Matt Kramer’s New California Wine. He spends the first part of the book describing how Californian vintners think about wine, how this differs from “Old World” vintners and how this impacts the style of wines made there. This section of the book is derived from both years of interacting with the people who create the wines of California and his own philosophies. He next goes on to discuss the American AVA system. He’s forthright and honest with his assessments of all that is good and bad about this system (in fact there is little good at all). And while some may not agree with everything he says; it is genuinely informative and insightful. The latter three quarters of this wine book focuses on frank assessments of the quality of hundreds of wineries in Napa, Sonoma, the Central Coast, and Beyond. Rather than the standard dry run of vintages and tasting notes, Matt Kramer injects some color into his notes discussing the owners’ characters and their impact on the wines. This section is very comprehensive though not all encompassing and will help anyone planning a trip or a purchase of Californian wine to identify the best producers at any price range.